Electronic Kit School. - There are many application of astable multivibrator IC 555 for electronic devices today. As the precision timer, NE555 can applied to design application based on Fingerprint Biometrics, Iris Biometric, RFID reader, and other application. NE555 IC have features as like Timing From Microseconds to Hours, Astable or Monostable Operation, Adjustable Duty Cycle, TTL-Compatible Output Can Sink or Source Up to 200 mA, On Products Compliant to MIL-PRF-38535, All Parameters Are Tested Unless Otherwise note. In this article we will apply this NE555 IC to build one electronic circuit that can produce negative supply from positive supply that maybe will give you reference circuit to result the negative power supply from positive supply easily. 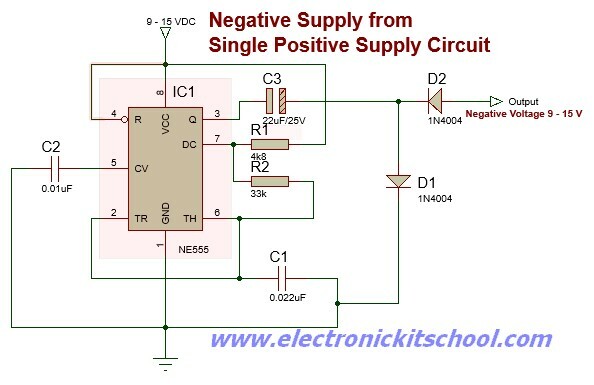 Circuit like in Figure 1 above show you about the Negative Power Supply Circuit from Single Positive Supply using Astable Multivibrator NE555 IC that can give you converting from positive source 9 - 15 VDC to negative source. Usually to produce negative supply like - 9 volt, we using transformer with CT part and using LM7909 to regulate this voltage. But using circuit like in Figure 1 above we enough to provide NE555 and few component supporting to build single negative supply. In this circuit that the 555 IC served as an astable multivibrator with a frequency of more than 1kHz. The output of this IC produce a square wave at the pin 3 . The capacitor C3-22uF charges through the diode D1 when the output positive. And when the output is ground, it make the capacitor C3 discharges through the diode D2 and charges the 100uF capacitor (in circuit above not drawing and you can add it with connect capacitor 100uF at output to the ground) is charged. The output at pin 3 is taken across the 100uF capacitor as shown in the Figure 1 above. Although the circuit above can produce negative supply, but a disadvantage is its poor of voltage regulation and the current limiting. The maximum current that can be drawn from this circuit is more than 40mA only. As note that if you draw more current, the regulation will be lost. Other disadvantage again is the output negative voltage will be a little less than the positive supply due to the diode drops of D2. For example if the voltage is +9V then the output voltage will be about 7.5 V because D2 need drop voltage more than 1.5 Volt.